The Pueblo Trail is located in the Chimney Rock National Monument in southwestern Colorado between the towns of Durango and Pagosa Springs. The trail climbs a narrow ridge below the pinnacle peak of Chimney Rock mountain. Along the way the trail passes some excavated and some unexcavated ruins until near the summit it comes to the remains of an actual Chacoan great house. Visitors will be charmed by the extensive ruin high atop the forested ridge with the prominence of Chimney Rock towering nearby. Chimney Rock became a National Monument in 2012. Currently the Monument is only opened seasonally from May 15 through September 30. As of this posting in 2013 a National Parks Pass isn't honored at Chimney Rock so all visitors will have to pay the entrance fee. Unfortunately there were several people that had Parks Passes that made the long trip to Chimney Rock only to be turned away because they couldn't afford or justify the added expense. Chimney Rock is operated by the all volunteer staff of the Chimney Rock Interpretive Association and at present it doesn't receive any money from the Parks Service for maintenance. The Pueblo Trail is open only to guided tours. The sign in this picture shows the times that those tours are offered each day. The guided tours take 2 1/2 hours from start to finish for both the Pueblo and Great Kiva trails and 1 1/2 hours for just the Pueblo trail. The combination tour is only offered at 9:30 and 10:30. Since schedules may change from year to year consult their website for the latest information. After paying the requisite fees visitors will drive up a gravel road to reach the upper parking area and trailheads for both the Great Kiva trail (self guided) and the Pueblo trail (guided tour only). Allow about 30 minutes to pay the entrance fee and to drive to the upper parking area. The first stop on the tour is at the Ridge House pueblo near the trailhead. It is always nice when not everything is carted off to a museum somewhere. This metate shows a fantastic amount of wear. We were told that most tour groups aren't this big. This was the next to the last tour on the last day of the season so that may have had something to do with the size of the crowd. The trail is probably steeper than most people are accustomed to. This picture was taken near the narrowest area of the ridge. Several people in this group called it quits and turned around a little past this point. For those people the trail was too strenuous. For us we felt the trail was too short to be anything other than easy but we picked the middle ground and rated it moderate. The total elevation gain is about 200 feet. For hikers accustomed to the mountains of Colorado that is barely a bump but for others it might appear daunting. Another great kiva dominates the site of the Chacoan style Great House Pueblo at the top of the ridge. Numerous rooms make up the remains of the great house. While nowhere near as impressive as the Inca city of Machu Picchu that is nestled high in the Andes of South America the Great House Pueblo in the San Juan Mountains of Colorado still brings the ancient Peruvian city to mind. 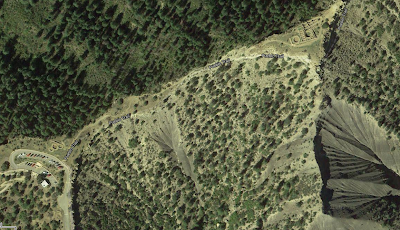 This is a screenshot of the Google Map of the ridge set to satellite view. If you click on the map at the top of this page and change it to satellite you can zoom in even further for a close up view. We included it here just to show a unique perspective of the trail and to point out how well the ruin shows up from above. Chimney Rock is the monolith at the end of the ridge. From the valley floor it is obvious that Chimney Rock is much higher than the other spire which is known as Companion Rock even though in this picture the illusion is otherwise. Across the Piedra River to the west on Peterson Mesa lies a two-story Chacoan C-Block Pueblo that has a direct line of sight to the Great House. Five days before the fall equinox, and after the spring equinox, the sun rises between the two pinnacles of Chimney and Companion Rocks. Calendar sites such as these would have been critical for both the timing of annual festivals and the planting of crops. This is a look back down the ridge toward the parking area. The biggest reason the Pueblo trail takes 1 1/2 hours to complete is because the guide stops about a half dozen times and talks about 10 minutes at each stop. The frequent stops give the less active visitors plenty of time to rest as they make the climb up the ridge. It is actually possible to visit the monument without paying the fee and taking a tour but you will have to come after September 30th and prior to March 1st. The gate will be closed so you will have to park at the highway and either walk or bring a horse for the 3 mile hike up the mountain. The elevation gain for that hike would be about 1000 feet. If you would like to see it for yourself then all you have to do is 'Take a hike'.